Is This Season Finally The One Where Leeds Get It Right? For Leeds United fans, the hangover from the World Cup has yet to even kick in. New manager syndrome has got them rocking and the Elland Road club are sitting nicely at the top of the pile in the Championship. There’s an element of optimism, like things will be different this season, just as there was this summer under Gareth Southgate. Marcelo Bielsa has transformed the club, and while they were very much in the same position this time last season, you get the impression that Leeds genuinely will be promotion contenders this season. That’s if they don’t self-destruct of course. The Argentinian has certainly impressed though and you get the sense that if there’s one thing he isn’t going to do it’s implode. His bucket stance is enough to show you the relaxed nature of the man, while he wowed Leeds fans before a ball was even kicked. He’s been meticulous in his detailing this summer, ensuring he had two players who can play in every position, while he’s been spotted a number of times at academy games - a man truly immersed in all things Leeds. It’s been well reported that he sat down and watched all of the club’s games from last season before even taking the job, identifying where they could improve and essentially demanding where new recruits are needed. Everything at the club suggests ambition. Bielsa is certainly operating at Premier League level, while owner Andrea Radrizzani admitted the likes of Antonio Conte and Roberto Martinez were key targets ahead of approaching the 63-year-old. So far, he’ll certainly be happy with what has unfolded from there. On the pitch, Leeds have been a different animal to last term. Their football is borderline relaxing, playing some scintillating stuff that can only make you sit back and admire. 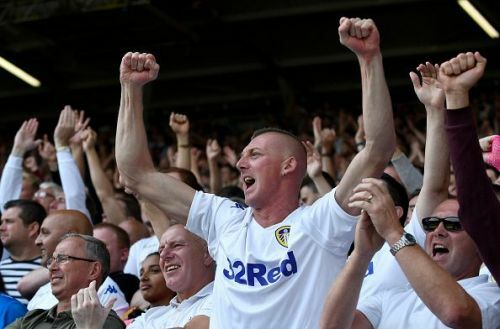 Swansea were, of course, that just last season, but it’s now been 14 years since the Elland Road faithful last saw top-flight action. They followed that up with a Bank Holiday win and they’re now 9/2 favorites to win the Championship, ahead of the likes of Aston Villa, Stoke and West Brom who all started the season with high stock. The coming weeks will be important for Bielsa. The Championship can be cutthroat and if the Yorkshire club can continue to ride this crest of a wave, with the likes of Kemar Roofe firing on all cylinders, confidence and optimism can only continue to build. The Championship hasn’t seen football like this for some time. Last season Leeds went seven unbeaten at the top of the table. They eventually finished 13th. This time, Bielsa’s wheels look far from falling off.